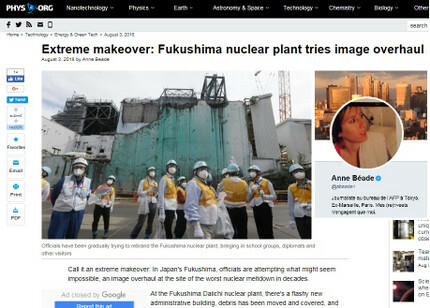 ・　Since May, visitors have been able to move around near the reactors on foot, rather than only in vehicles, and they can wear "very light equipment," insists TEPCO spokesman Kenji Abe. That ensemble includes trousers, long sleeves, a disposable face mask, glasses, gloves, special shoes and two pairs of socks, with the top pair pulled up over the trouser hem to seal the legs underneath. And of course there's a geiger counter. ・　But the upbeat messaging belies the enormity of the task TEPCO faces to decommission the plant.